The Canterbury Singers performed Michael Hurd‘s Music’s Praise for their annual concert in the Chapter House in Canterbury Cathedral in 1973. Chris Godfrey is a bass who has been singing in the choir for 50 years. When the Musical Director, Anthony Stutchbury, chose the piece for a concert, Chris wrote to the composer to ask him if he would like to attend. As Michael Hurd lived in Liss, a two hour drive from Canterbury, Chris’s wife, Janet, offered to provide him with a meal and a bed for the night. On the day of the performance a green MG sports car drew up and a youngish chap dressed in smart casuals, got out. Chris was surprised. ‘I wasn’t sure what a composer would look like but I wasn’t expecting someone who looked like an ex-RAF pilot’. 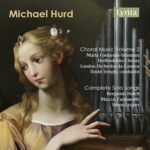 Michael Hurd periodically taught composition at the Royal Marine’s School in Deal so perhaps he had absorbed some of the atmosphere. After the performance Chris, Janet and Michael got chatting over a beer at home. The conversation flowed easily. Chris was curious about the commissioning process and asked how the choir could set about it. ‘Just ask me!’ was the reply. Chris asked how much a piece like Music’s Praise might cost. Michael Hurd mentioned a figure, which Chris and Janet can’t remember, but it seemed affordable. Sadly the Canterbury Singers had no funds. The composer felt that if the choir could raise half the cost, the Canterbury Arts Council would probably match it. Janet suggested holding a jumble sale which was a tried and tested method for raising money at the time. Michael was amused and said it was the first time he’d had a commission funded this way. Chris proposed that, if the committee agreed, they would like a piece to suit soprano soloist plus SATB voices. They would aim a concert the next year if the piece was finished in good time for rehearsals. Michael Hurd had an idea for a piece of music already in his head which he agreed to develop for the Singers. The Phoenix and the Turtle is an allegorical poem by Shakespeare that tells of the tragically frustrated love of two birds. Scholars have spent many years speculating on the meaning of the poem. One theory is that it refers to the love between Queen Elizabeth 1st and one of her courtiers. There are many layers and this makes it a perfect playground for musical imaginations. The Canterbury Singers performed the premiere of The Phoenix and the Turtle with a piano accompaniment. The string and timpani score was written before publication by Novello in 1977. 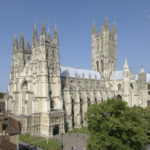 The Canterbury Singers have a full calendar of their own concerts and as a stand-in choir at Canterbury Cathedral when the Cathedral choir is away. Their current Musical Director is Adrian Bawtree, an assistant organist at the Cathedral. The Singers regularly use their best voices as soloists. For example in their recent performance of parts of Rachmanov’s challenging All Night Vigil the contralto & tenor soloists were choir members. For more information about the choir follow the link.